A revealing biography of the celebrity crime reporter, novelist, and notorious raconteur. 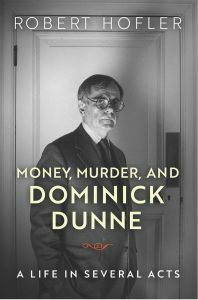 Dominick Dunne seemed to live his entire adult life in the public eye, but in this biography Robert Hofler reveals a conflicted, enigmatic man who reinvented himself again and again. As a television and film producer in the 1950s–1970s, hobnobbing with Humphrey Bogart and Natalie Wood, he found success and crushing failure in a pitiless Hollywood. As a Vanity Fair journalist covering the lives of the rich and powerful, he mesmerized readers with his detailed coverage of spectacular murder cases—O.J. Simpson, the Menendez brothers, Michael Skakel, Phil Spector, and Claus von Bülow. He had his own television show, Dominick Dunne’s Power, Privilege, and Justice. His five best-selling novels, including The Two Mrs. Grenvilles, People Like Us, and An Inconvenient Woman, were inspired by real lives and scandals. The brother of John Gregory Dunne and brother-in-law of Joan Didion, he was a friend and confidante of many literary luminaries. Dunne also had the ear of some of the world’s most famous women, among them Princess Diana, Nancy Reagan, Liz Smith, Barbara Walters, and Elizabeth Taylor. Dunne admitted to inventing himself, and it was that public persona he wrote about in his own memoir, The Way We Lived Then. Left out of that account, but brought to light here, were his intense rivalry with his brother John Gregory, the gay affairs and relationships he had throughout his marriage and beyond, and his fights with editors at Vanity Fair. Robert Hofler also reveals the painful rift in the family after the murder of Dominick’s daughter, Dominique—compounded by his coverage of her killer’s trial, which launched his career as a reporter. —Available now on Amazon | Barnes & Noble.